Team Mangalore, a brain child of Mr.Sarvesh Rao, has as its members, people of determination, dedication and enthusiasm. In addition to these team members, there are a number of persons who directly and indirectly assist us in our activities. Prominent among them are the members of Youth Hostel Association of India, Mangalore, employees of Guru Winders and the family members of the Team. Founder Member and Proprietor of Guru Winders, Mangalore. As a child, kites fascinated him but he had no opportunity to fly them. A chance visit to the Kite Festival in Gujarath(1998), as a youth revived the lost passion. On his return back, he teamed up with a few like minded friends and formed Team Mangalore. An Employee of ONGC-MRPL. He has been associated with 'Team Mangalore' from the time of inception. With his mechanical engineering background, he is instrumental in providing the technical know-how and design of all kites made by the Team. An Artist by profession. He is a man of few words and lots of action. 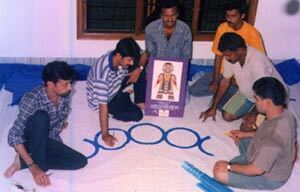 He is responsible for putting on paper, the design and art work, the colours of every kite at the initial "idea" stage. It is his art work which gets translated into a kite using appropriate materials. An employee of KIOCL, Mangalore . An enthusiast who helps at every stage of kite making/flying with dedication. An surveyor by profession. A Multi talented personality, also vintage enthusiast. Although he joined the Team very recently, helps in every aspect whenever time permits. A Chartered Accountant by profession. He is actively involved in numerous social work and NGO activities. A source of inspiration from the very beginning, Mr.Nitin is the Chief Advisor of the Team. He also takes care of Public Relations aspect of the Team. A Chartered Accountant working in the Finance Department of Mangalore Refinery and Petrochemicals Limited, a subsidiary of ONGC Ltd. He has been associated with 'Team Mangalore' in various activities of the Team such as kites flying, public relations, co-ordination for the events of the team. Also, an active trekker and has participated in Himalayan Trekking and other regular treks conducted by YHAI. An artist by profession and working as Artist in AB Shetty Memorial Institute of Dental Sciences. 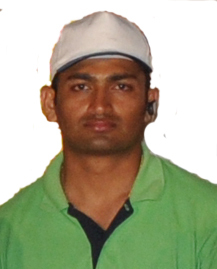 He is an animation expert and has been associated with 'Team Mangalore' in various activities of the Team. An active trekker and has participated regular treks conducted by YHAI. An Event Management and Publicity Consultant. With wide experience in Mega Event Handling , he has been associated with 'Team Mangalore' in various activities of the Team such as media interaction, publicity and management of events conducted by the Team. He has also participated in various kite flying events and workshops conducted by the Team. An entrepreneur. He has been associated with 'Team Mangalore' in various activities of the Team. He has represented the team in various kite festivals and participated in kite workshops organised by the team. Proprietor of an Event Management Firm. A management professional owning STS Total Solutions, an Event Management Firm, has been associated with 'Team Mangalore' in various activities of the Team such as publicity and management of events conducted by the Team. He has also participated in various kite flying events of the Team.